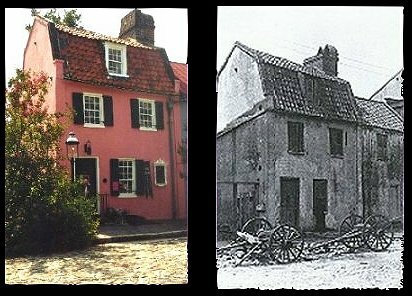 The following is a history of the Pink House from it's beginnings in the mid 1690s to the present day, with pictures of both at the end of the text. The Pink House is architecturally Charleston's most unique building. The fact that it had only one room on each of three floors has been featured to tourists for many years. The low ceilings and narrow staircase are not typical of Charleston. The first and second floors each have one square (13 feet by 13 feet) room with an oversize fireplace. The third floor is a garret of the same size, but the walls slant in, following the lines of the gambrel roof, which is one of the few gambrel roofs in the city. The huge fireplaces which were used for heating, but also for cooking, are unusual, since most Charleston houses had separate kitchen buildings in the rear. No evidence of an outdoor kitchen dependency has been found near the Pink House. The Lowcountry black swamp cypress paneled walls lend a prerevolutionary feel. One can imagine long trestle tables on either side of the fireplace and rough sailors banging their mugs for more ale. The location on one of Charleston's few remaining cobblestone streets adds to the image. Real estate records show that Thomas Coker was the tavern owner in the 1750s. In the latter part of the nineteenth century, the Pink House deteriorated and was not really repaired until the 1930s when Mr. and Mrs. Victor Morawetz (New Yorkers who also restored Fenwick Hall and several other Lowcountry properties) purchased the little house and did extensive restoration. It was during this renovation that the small wing on the southeast corner was added, as space in which caterers could work, since the Morawetzes used the building strictly as a place to entertain. This wing now houses the teal print room and office space. In 1946, Henry McInvaill, Jr., purchased the Pink House and had a small publishing business here. He supported many artists, by having exhibitions and studio space for them. Charleston's most famous painter, Alice Ravenel Huger Smith, had her studio and painted in the Pink House until 1953, which thrills the gallery's present artists. We feel we're showing on hallowed ground! While used as Miss Smith's studio, the Pink House was also the founding site for an unusual club called the Piping and Marching Society of Lower Chalmers Street. (Chalmers Street is only two blocks long.) It was begun by a group of World War II veterans for philosophical discussions and judicious beer drinking. Each month a member gave a serious paper on a subject outside his chosen professional field and during their 'Winter Rout', a prize was awarded for the best presentation. At this meeting and at their 'Summer Frolic', the group marched through the city accompanied by bagpipes. Many prominent names appeared on their roster. The building continued for a few years as The Pink House Galleries, with Louis Lawson displaying his own works, as well as those of many other national and international artists. Several had their first one-man shows in the Pink House. The building has a history of association with painters. Attorney Frank H. Bailey purchased the Pink House in early 1956 and another full renovation took place. The building retained its prerevolutionary flavor with the cypress paneling lining the first and second floor rooms. Mr. Bailey, a senior member of the South Carolia Bar, and his partner, Mr. Edward D. Buckley, established their law offices in the Pink House. They lined the roofline slanted walls of the third floor garret with bookshelves to house their law library and installed a full partner sized (4 feet by six feet) desk in the little room, that had to have been built there since it would not have fit up the stairs or through any window. The Baileys had all the electric and telephone lines buried under the slate sidewalk and had the little rear wing roof tiled to match the original roof. They added the tiny powder room to the right rear, (the first real plumbing for the building) and kept the highwalled courtyard with its fountain and flowers. A large adjacent building on the east side of the Pink House, where the parking lot now is, was razed in the 1950s, opening up the view considerably. The Pink House was often included on historic tours during the '50s and '60s. The Pink House is owned now by Mr. Bailey's daughter. After Mr. Bailey's death in 1987 it became a gallery again--featuring the pottery and paintings of Sherry Palumbo, whose work can now be seen at The Mudpie in Mount Pleasant. In October 1994, the Pink House reopened with the paintings of Alice Stewart Grimsley, Bruce W. Krucke, Alexandria H. Bennington, and Anne C. Thomas. Some art work by certain friends is also exhibited. The gallery is the exclusive venue for the well known primitive style plantation paintings of the late Ravenel Gaillard. Marsha M. Blandenburg and Julia S. Rivers also display at the Pink House. Considerable refurbishment was done at the time this new gallery began and it is hoped that people will come to see the unique architecture again and enjoy the intimate courtyard, the wonderful views out of the upstairs windows (of St. Philips over the French Hugenot Church and all the different rooftops and chimneys), and, of course, the art work. What was once a tavern and brothel has now become 'the best little art house in town'!